Rescuers who guided 44 pilot whales out of shallow waters are monitoring a remote Highlands coastline to make sure they do not become stranded again. Medics from British Divers Marine Life Rescue, the coastguard and the Navy were called to the Kyle of Durnes after the pod of more than 60 was spotted. Forty-four were encouraged back to sea but 25 did not survive. Rescuers said that three whales still alive would be euthanased as their condition was not good for refloating. Post mortems examinations will be carried out out on bodies on the shore to find out the cause of the stranding and the deaths of the whales. The team of helpers managed to rotate whales that were upside down to prevent them from drowning when the tide came in. Medics from as far as Newcastle responded to the incident and nine sets of pontoons were delivered to the site overnight. Although they were not used because the estuary flooded too quickly, they will remain on the site in case they are needed over the weekend. A number of volunteers are currently searching the coast, lochs and headlands for evidence of the whales which had returned to open water. 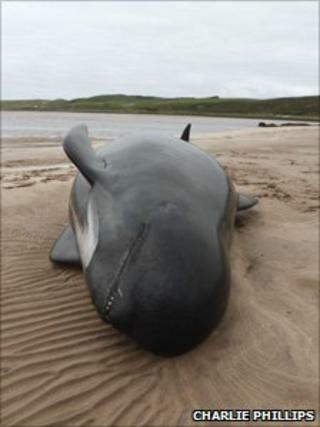 In May, two pilot whales were found dead in a Hebridean loch after experts feared more than 60 of the animals had been at risk of becoming beached. The pod had got into difficulty in Loch Carnan in South Uist.